So you've decided to take your Miniature Schnauzer to a dog groomer. And luckily for you, there are lots of groomers in your area to choose from, too. But... how do you go about choosing the best one for your dog? Finding the right salon to take your precious Miniature Schnauzer requires a little bit of investigation on your part. Investigation? Really? What could go wrong at the groomers? Let me tell you... I've seen and read too many horror stories about dogs being mistreated, injured or even dying during a grooming session. Can you imagine? You take you Schnauzer in for a bath and trim and get a call from them saying your dog is DEAD! A Marietta family is grieving after their dog died at a local groomer. The groomer claims that the dog choked on its own leash, but the family does not believe him. Tom Wall said Jesse, a teacup Schnauzer, was dropped off at the A&P Pet Salon and several hours later, Jesse was dead. The Walls said they never got a phone call. He said the owner of Pet Salon claims Jesse strangled on his leash after he was put back in a crate after grooming. However Wall believes Jesse was left unattended on the table. Though the salon owner insists the dog was not left unattended on a grooming table, other groomers said it's a common and dangerous idea. Paula Schoch, the grief-stricken owner of 2-year-old Nannie, told us her Schnoodle was left unattended on a table with its head in a groomer’s noose. There was no one around to rescue Nannie when she fell over the side. Now Paula and her family are struggling to deal with the loss of her dog. The Villeggiantes dropped a toy-sized dog named Masquina off at Caudle's Canine Castle (Vacaville, CA) about 10 a.m. for a wash and trim. Paul Villeggiante said about 30 minutes later, the groomer called to say Masquina was dead. The groomers said they left Masquina unattended on a grooming table and came back to find her hanging off the edge, strangled by her leash. Do you need to read more? I didn't think so. So, before you hand over your precious Miniature Schnauzer to a complete stranger... DO YOUR HOMEWORK! 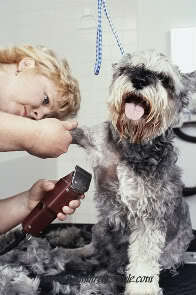 Below find out what you need to know before taking your Schnauzer to a dog groomer. • Get Referrals: Ask your friends who own pets, who they use as their groomers. Ask your veterinarian. Your Miniature Schnauzer's vet will probably know of a reputable dog groomer in the area for you to check out. note: only ask if the vet office does not provide a grooming service. You can even get referrals from strangers! Yep. Think of the beautifully groomed dogs you see at the dog park, for instance. Go on up to the owner and ask them who they use. Dog owners love sharing their knowledge and information about dog care with each other. Not to mention feeling a sense of pride in your compliment. • Better Business Bureau: Before you take your Miniature Schnauzer to any grooming salon for dogs, check with the Better Business Bureau. The Better Business Bureau can alert you of any complaints against pet salons or dog groomers in your area. 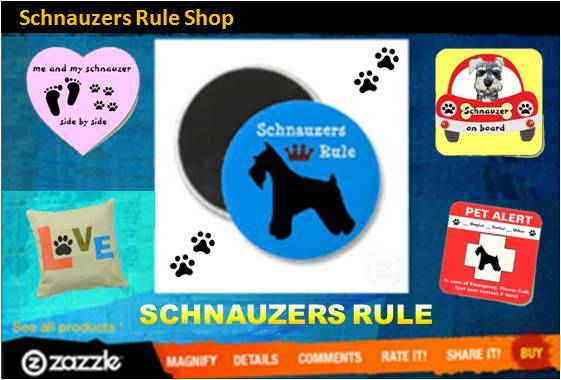 • Check Them Out: Now that you have a list of potential groomers for your Miniature Schnauzer its time to check them out. Is the grooming salon clean? Does it smell nice? How many groomers work in the salon? What type of education and training do the groomers have? Are the groomers experienced in grooming schnauzers? What type of restraints (if any) do they use in their salon? What products and chemical do they use on the dogs? Certain flea and tick treatments can cause a rash, illness, or even death, especially if the incorrect amount is applied. So always find out exactly what will be used on your dog. Where will your Miniature Schnauzer be kept while he's not being groomed? Will you receive a Pick-Up call when your Miniature Schnauzer is ready? Are they willing to provide you with referrals from clients? Do you feel comfortable with the groomer? And if you have the time why not learn to groom your Schnauzer at home? When you groom your own dog, it provides yet another opportunity to bond with your dog. But no matter who or where your dog is groomed, you want to make sure your Miniature Schnauzer will be safe, comfortable, and treated kindly. 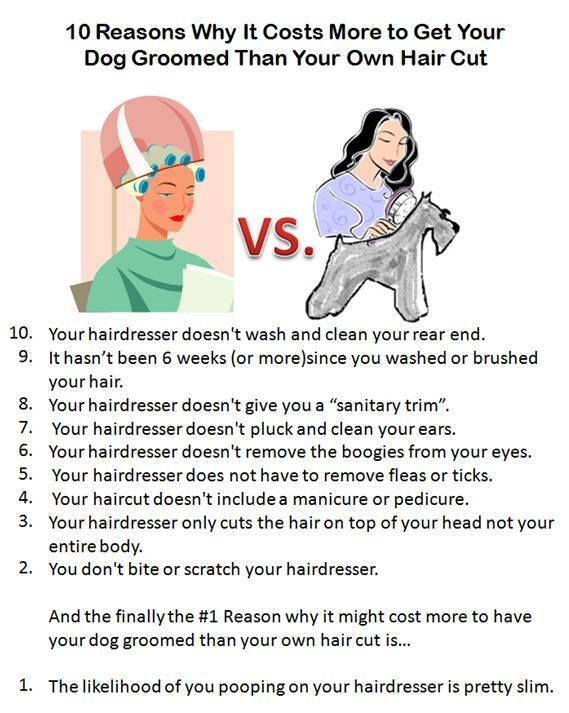 And if you've ever wondered just why some groomers costs so much, this infographic just might have the answer: BOL! Do you prefer to groom your Mini Schnauzer yourself or not?